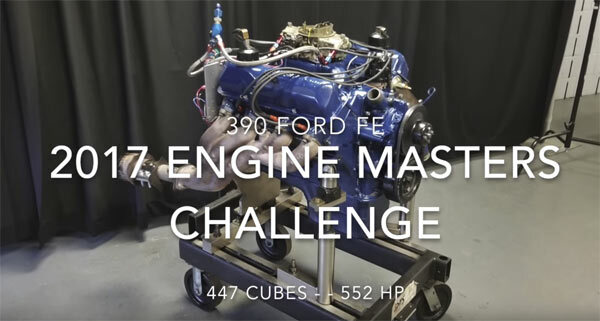 This engine is the entry into the Engine Masters by Survival Motorsports with a Ford 390 445 stroker package producing 552 HP. The engine was dressed in for blue paint with added CNC ported Survival Heads, a Performer RPM intake, a Comp flat tappet cam, stock rocker covers and 7mm repro plug wires and cast iron manifolds from a 427 Galaxie. You can see the guys in the video testing out the engine in showing you just how worthy of these older engines can still be.